Pinterest is the 3rd most popular social network in the world. As a visual image-based platform that has 70 million users, it is ideal for eCommerce, especially when you’re selling physical products. This year’s Ahalogy report found that active Pinterest users are young, tech-savvy and have more disposable income than non-users. The most active users are what many marketers are now calling Millennial Moms—they have young children in the home and grew up with smart phones and social media. 38% of active users have purchased online or at a traditional retail store because of something they saw on Pinterest. I’m not going to write about how important it is to have appealing visuals, business account that is verified and has boards with enough Pins, because you already know that. I’m talking about ways that bring you from mid-level to advanced user when it comes to optimizing your Pinterest strategy. These steps can help you increase site traffic, get the most out of Pinterest and ultimately boost your sales! Add the Pin It Button to your website’s pages to make it easier for customers to share your articles, products and services on Pinterest and drive new traffic from Pinterest back to your website. If you sell products, install it on every product page! The Pin It button is a Pinterest feature that makes it easy to pin content a user finds on the web and not directly through Pinterest. About one-third of active Pinterest users have the Pin It button installed in their browser so that they can pin content from their favorite sites. 72% of active female and 69% of active male Pinterest users would find it helpful to have the Pin It button installed on their favorite websites. 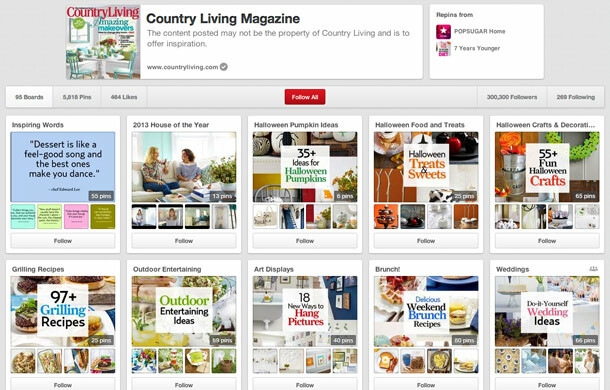 These Pins link back to your website and increase the spread of your content across Pinterest. You can find the Pin It button integrated into popular platforms, including Tumblr, Blogger, WordPress, and also – Magento based sites. Also, it’s available for Android and iOS. And if you want to get more fancy with it, use On Hover Pin It button that remains invisible until someone mouses over an image on your page. After tracking popular Pins, you can easily meet your customers’ needs and have plenty of stock on hand for purchases. 2) Additional options – no Pinning from my site, thank you! This site doesn’t allow pinning to Pinterest. Please contact the owner with any questions. Thanks for visiting! Of course, you can also customise the message or turn off Pinning on a single image. Rich Pins are topic-specific details you can add to pins to provide extra information to followers. Right now, there are 5 types of Rich Pins: movie, recipe, article, place and product. 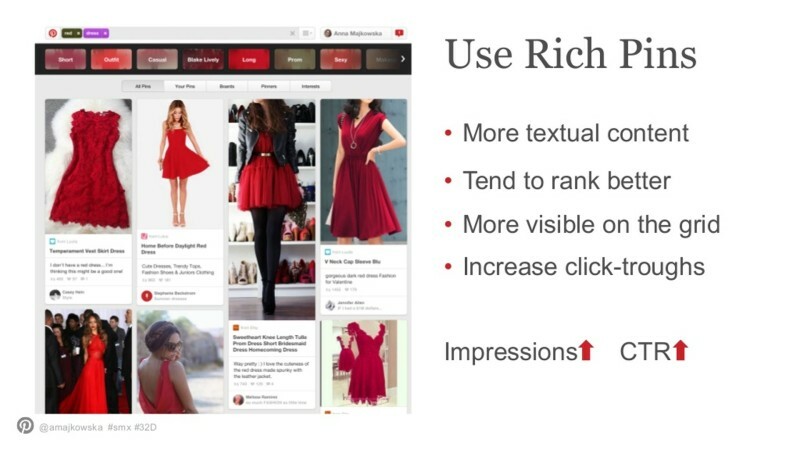 Setting up Rich Pins for your site should also improve your results on Google, and other search engines, because the same markup Pinterest uses is used to generate rich snippets that display in off-Pinterest search results. Recipe Pins include ingredients, cooking times and serving info to get Pinterest cooks excited to hit the kitchen. Recipe search filters help Pinners narrow in on vegan, vegetarian, gluten free, pale and indulgent meal ideas. Place Pins include map, address and phone number. This one is really important if you also have brick and mortar stores! Product Pins include real time pricing, availability and where to buy. Pinners also get notifications when product Pins they’ve added drop in price. 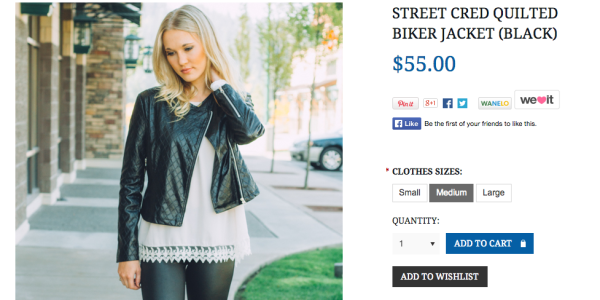 Did you know that Pins with listed price have a 36% higher chance of being liked? Now, that’s something to take in mind. Grace and Lace Pinned their boot socks that spread across Pinterest like wildfire and helped spark their business. In July, Grace and Lace had an average of 5,600 viewers to their Pinterest account and by September they averaged 561,465 viewers. They added Rich Pins to their site, hopeful that the email notifications Pinners receive when Rich Pins drop in price would help more people go from Pinner to customer. In just two weeks, they’ve seen Rich Pins increase site traffic by 38%! How can I get Rich Pins? Decide what kind of Rich Pin you want to apply for from these 5 types, read the documentation for your type, add the appropriate metatags to your site, validate them and apply to get them on Pinterest. Simple as that! You can choose method that fits you best – oEmbed or Semantic Markup, the guide is here. 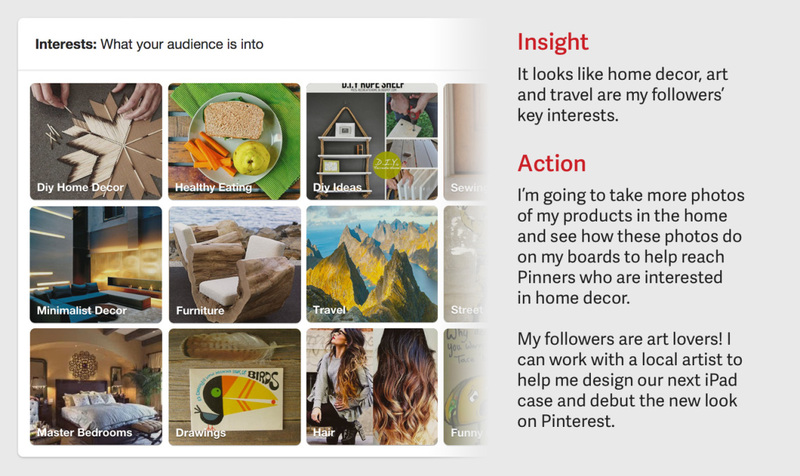 Pinterest is getting closer to launching Promoted Pins worldwide. In May, smaller retailers were testing it and paying only if ad is clicked, no minimum spend, and in August, more businesses were invited to join the program. Promoted Pins should be available to all retailers soon. This is huge news for e-retailers not only because of Pinterest’s massive audience, but because of the timing. Users typically spend an increased amount of time on the platform looking for creative gift ideas. Last year, 54% of users spent more time on the site during the holidays, and 94% say it changed the way they prepped for the season. It’s prime time to promote your pins. Pinterest users average checkout value is double that of Facebook’s and almost three times that of Twitter’s. The spirit of Pinterest is longing for products and creations you don’t have, while other sites like Twitter and Facebook don’t catalog your scrapbook of must-haves. Pinterest users simply have a higher likelihood of purchasing products shown on the platform. This year’s Ahalogy report found 38% of users bought something because they saw it on Pinterest. Add a Pinterest button or widget to your website. You can also add a Pin It button to your iOS or Android app. Choose among Pin It Button, Follow Button, Pin Widget, Profile Widget or Board Widget. Every one of them has custom options that you can explore. It’s great that you have your communication and promotion tactics and strategies, but they are worth nothing if you don’t learn what your audience really looks for and what content they share. With Analytics, get advice on how to increase impressions, clicks and Repins so you can refine your Pinterest strategy and reach more people. 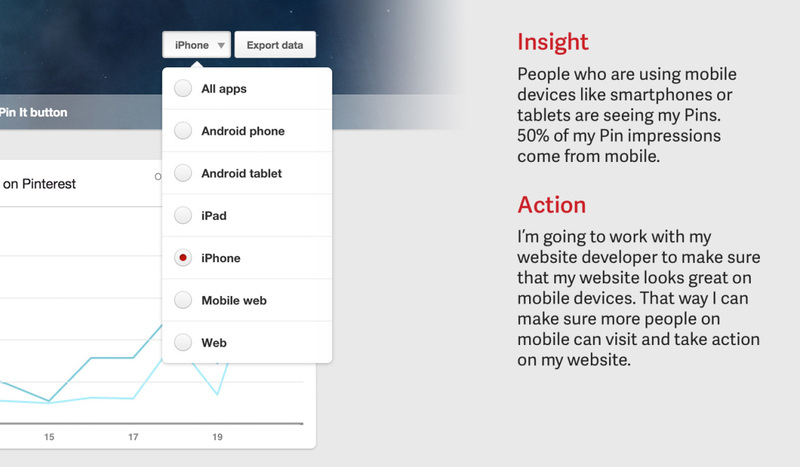 With Pinterest Analytics, you’ll also learn how adding the Pin It button to your website leads to referral traffic from Pinterest and who your audience is, including their gender, location and other interests. It will also track your Promoted Pins and Rich Pins analytics. Tip: Use Pinterest Analytics to see which product Pins people like most and make this product more prominent on your website and keep those items in stock! Interests: This is a visual overview of what your followers are into. These subjects can give you ideas for your content strategy, helping you connect with your customers and stay relevant to more people. 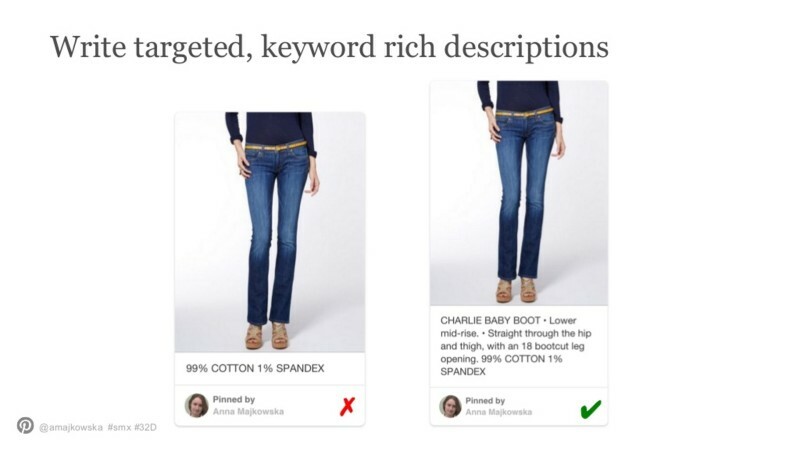 Make sure to fill the descriptions with searchable keywords that describe the product or page, says Search Engine Land. But avoid sounding spammy, because the descriptions serve as captions. They are rarely changed by Pinterest users sharing them, but are less likely to be Repinned or clicked upon if they aren’t appealing to humans. Also avoid using too many hashtags, because it may negatively impact your ranking. 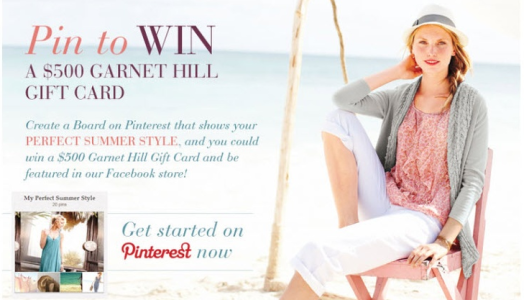 If you have, or are building, your email subscribers base, don’t neglect Pinterest. It is your friend. Look it as a customer engagement program and experiment with it. Feature your popular Pins in emails, and include strong calls to action like “Follow Name-of-your-brand on Pinterest” or “Give it a Repin.” Or create Pinterest-centric emails and enable people to Pin your product directly within the mail. To help drive a more connected experience with their Pinterest profile, Sephora created a board that appeared in their email that generated more than 14 000 Repins! See the full case study here. But don’t stop at that! For example, make a contest out of it. Look what Garnet Hill did. Neiman Marcus takes its Pinterest strategy one step further by leveraging the power of exclusivity and scarcity. 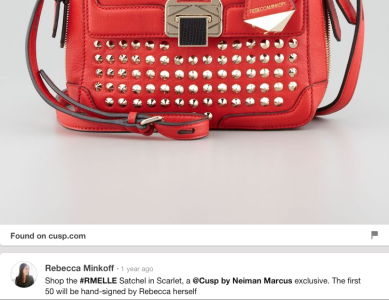 The retailer made a limited-time offer to its Pinterest followers; the first 50 shoppers who purchase Rebecca Minkoff Elle handbag in red will get it a hand-signed by Rebbeca herself. Interesting strategy. Country Living Magazine does something unique on Pinterest that almost no one else does: custom board covers. Not only is this extremely visually appealing, it also helps almost 400,000 followers see at a glance the types of pins they will find on the Country Living boards. There is so much more I could write and advise, getting in specific details of ways of promotion or specific brands. I hope to make series of posts on this subject, but I just wanted to cover the essentials first. These essentials will help to improve your Pinterest strategy, show more often your Pins in Pinterest search, and finally, drive more traffic and sales to your store. If you find this article Pinteresting (see what I did there? 🙂 ) and want me to write about a particular part of Pinterest marketing or SEO strategy, please leave a comment and I’ll do my best to make a new article. Hi, Maja. I like having the Pin-It button on my site, but would prefer for it not to take a customer completely away from the shopping experience when they pin something. Is there a way to specify that? to be honest, there is not much you can do to make it better, than you’ve already done on your page where you have Create a Pin form that opens in a new small pop up that takes you on Pinterest. That’s the option I see on most stores. Although, some brands have Pin It button that opens entire Pinterest page in the same window or new window, I would definitely not recommend that. It takes the customer completely away from your store. You can try some custom adjustments, as making the form open inside product page, below product itself, but in the end, it will again take the shopper to Pinterest and you will loose that shopping experience flow that you want to keep. I would stick to this Create a Pin form that you have, until Pinterest offers some new way to share that’s more UX/UI friendly. Really helpful and much actionable post. Few points are noted and will be explored. Thanks for sharing. Thank you, boss! I’ll do my best!